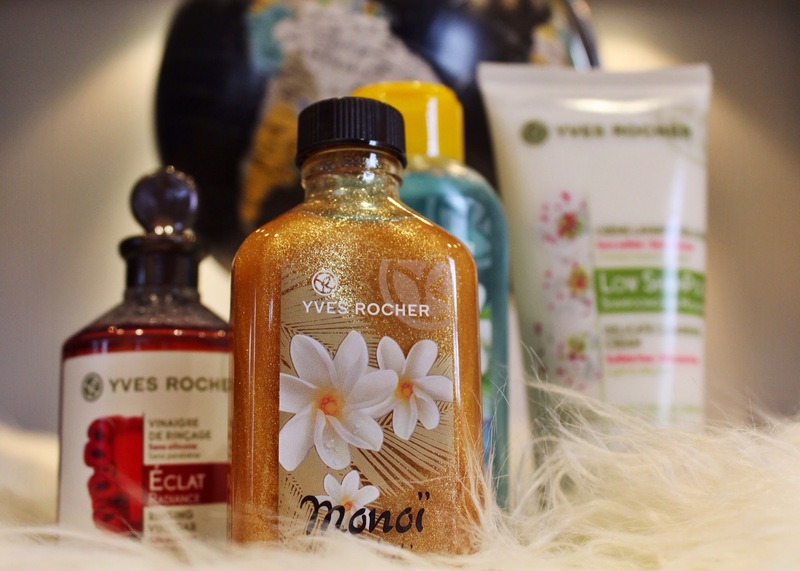 Mimi Flys: Getting summer ready with Yves Rocher! Getting summer ready with Yves Rocher! It's begging to look a lot like... Summer!! Is it too early to make such an outlandish remark? Probably. But London is so full of sunshine at the moment, it's hard not to get carried away! You might remember a post from a few weeks back, when I created a smokey eye look using Yves Rocher products. Well, Yves Rocher were a brand that I actually really enjoyed working with and I certainly have a new found love of their products since. So today I wanted to take a few moments to show you some of their fabulous summer collection - perfect to pack and take away with you on your holidays - I know that's what il be doing! 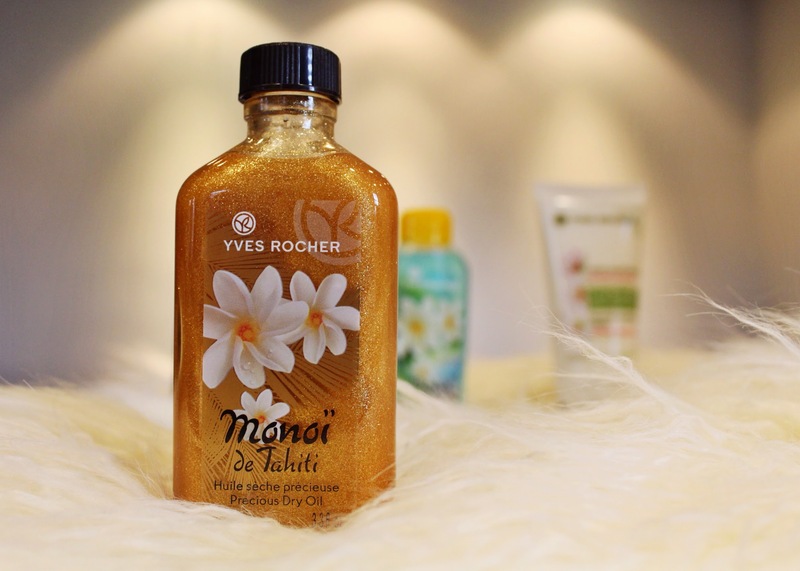 First up is my favourite of the summer range, Monoi De Tahiti - a dry precious body oil. Housed in an elegant glass bottle, this glimmering oil can be used on both body and hair (Personally i will be sticking to just the body, because oil plus hair equals a sad looking Barnet for Mimi!) It also enhances and nourishes a tan, and is super shimmery. It very much reminds me of the Nuxe dry body oil in that respect. Plus the frangrance is out of this world! 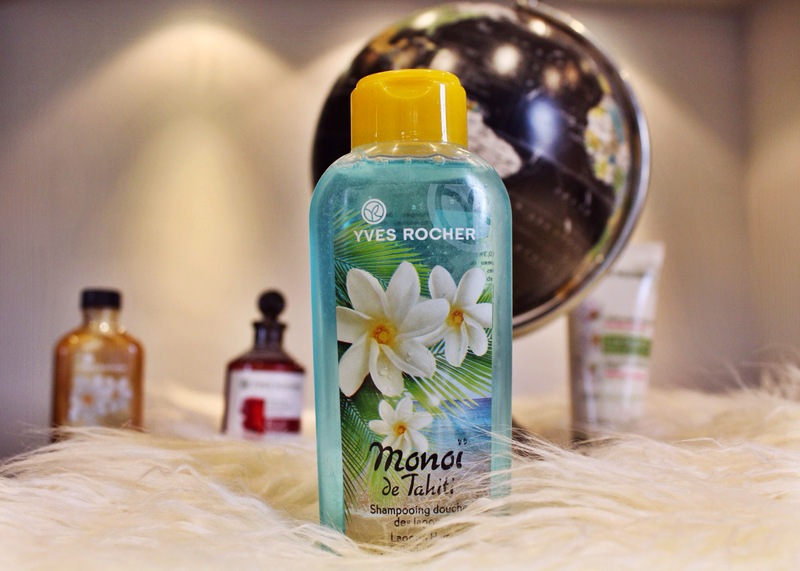 Imagine Tahitian flowers mixed with coconut oil and you won't be far off. I'm obsessed with this stuff, and I can't wait to slather it all over my limbs on my holiday to Dubai this week! My second must have of the range is the Monoi De Tahiti Lagoon body wash. Fragranced just like the body oil, this is a moisture rich hair and body wash that left my skin smelling AMAZING. Yes, capitals were called for. I couldn't get out of the shower and I'm already hunting down my next bottle. Just close your eyes and imagine your in paradise! The third product, and actually the one that has made the most difference to my shower routine is the delicate cleansing cream shampoo. The scent of this product is actually very subtle, more of a clean frangrace rather than an overly exotic one. The difference between this shampoo and others I've used is that it is sulphate and silicon free. It felt somewhat unusual not having a head full of lather in the shower (the sulphates are what make your shampoo lather up) so it felt almost like a conditioner to me. But once out of the shower I really enjoyed how much cleaner my hair felt. I love that this caring shampoo protects the integrity of the hair fiber, and I think it will work as a great after sun shampoo for damaged hair. Another one for my ever expanding suitcase! And last but not least, the most interesting of the lot. 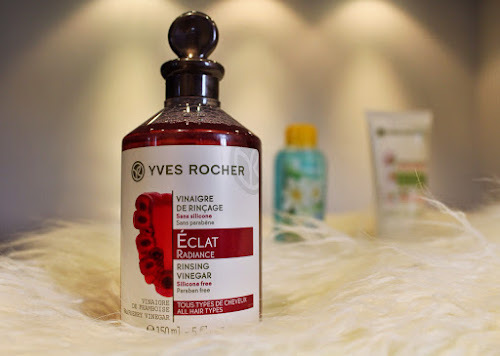 Éclat Radiance Rinsing Vinegar. Now, rinsing vinegar is not something I'm at all familiar with. In fact I was downright confused. I half expected to emerge from the shower smelling like a good addition to a plate of fish and chips, but in actual fact I left smelling mostly of raspberries. The rinse is an extra addition to your hair care routine, and claims to restore ultra-shine to your hair whilst softening the water. You basically pour a little over your hair before it's last rinsing and your good to go. I have to admit that I found this somewhat peculiar, but my hair did look shiny and felt extremely smooth so that may be down to this product. I'm not sure if I'm a huge fan of the smell, it's very raspberry-ish/ultra sweet. But I did get a few compliments on how nice my hair smelt, so others clearly appreciated. More than if I had smelt of fish and chips, anyhow. Which is always a good thing. 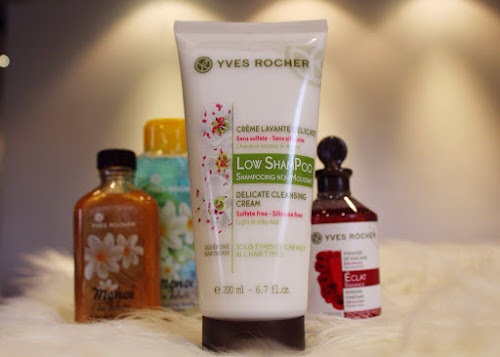 I'm really enjoying getting to know the Yves Rocher brand and their fantastic range of products, I know it isn't all that common as a brand here in the UK and so I'm enjoying trying products that I otherwise might have overlooked. Yves Rocher is absolutely huge in France, and with good reason. I love the brands values and their emphasis on natural beauty, so if you see their products around make sure you check them out - if only to give that Monoi De Tehiti Oil a good ol' sniff! Ahh... Paradise!